As regular readers of this blog will know, the whole problem with the EPA’s non-flexible mandate is that there is no commercially available cellulosic ethanol, thus making it impossible to meet the mandate. The EPA’s justification for this policy is that they need to maintain an incentive for companies to begin producing cellulosic ethanol, despite many past failures. The oil refiners are also required to purchase these cellulosic ethanol waivers, effectively giving the government money instead of purchasing the non-existent fuel. When reading about the potentials of cellulosic ethanol, I find very few optimists who are not financially tied to the industry and the government support that the industry relies on. The timing of government’s attempt to create both supply and demand for a new product was unfortunate, as the mandate began to ramp up significantly during the recession. However, we only have about 10 years until the Renewable Fuel Standard ceases increasing, and we have yet to produce any cellulosic ethanol at all. If you allow for some successes in the next 2-3 years, these will still be a drop in the bucket compared to the amount the government had “mandated” be produced. At the same time, the mandate continues to direct capital towards projects that aren’t competing on the merits of the technology, but are competing for guaranteed returns promised by our government. Taking his biomass yield assumptions of 12 tons an acre at face value (I doubt you can consistently get 12 dry tons per acre at large scale; commercial hay production is only around half that), we can do an interesting calculation. One million gallons of cellulosic ethanol has the same energy content as half a million gallons of crude oil. 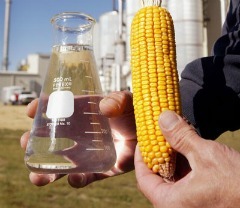 (Ethanol contains 2/3rds the energy of gasoline, but a barrel of crude also produces diesel, jet fuel, and fuel oil). U.S. oil production is presently 6.1 million barrels per day. That is 256 million gallons per day, 10.7 million gallons per hour, or 1 million gallons every 5.6 minutes. Therefore, taking his yield assumptions at face value, 1,000 acres of land planted in Miscanthus giganteus over the course of a year could produce the energy equivalent of under 3 minutes of U.S. oil production. Of course U.S. oil production does not come close to meeting our needs, so to put it in terms of total U.S. oil demand of 18.7 million bpd, 1,000 acres of Miscanthus would cover 55 seconds of U.S. oil consumption. Since that doesn’t take into account the petroleum that will be required to produce the cellulosic ethanol (e.g., running trucks and tractors), the net number would be even lower. They ought to take all that corn a stuff it where the sun doesn’t shine for the e.p.a. czar jackson. She is the biggest economy killer in the history of the nation, and should be brought up economy terrorism charges. And close the dam e.p.a. down, this was not its intentions. Starting with numbers in the last paragraph, it would take land area approximately the size of the two largest states (Alaska and Texas) combined to produce enough cellulosic ethanol to displace U.S. oil consumption. Or seen another way, it would take combined land area of the six largest lower-48 states (TX, CA, MT, NM, AZ, NV) to displace U.S. oil consumption. That is 29% of the land area of the lower-48 states. Cellulosic ethanol is a pipe dream. I am a former Automotive Engineer,if you add anymore alcohol to gasoline the the present mix (10%) it will in the long run damage the standard Gasoline engine in cars and trucks today! Surely, EPA has been warned about this by now, and I am sure that Alcohol production plants right now are unable to supply enough Cellulosic Alcohol to supply the entire U.S. needs if it these laws are mandated? Such action as proposed above is like anything else that comes out of EPA since Obama has taken office. Most of the staff at EPA are incompetent, and not knowledgeable in their fields? The answer to Americas problems with regards to this agency is, “shut down the EPA” they have outgrown their needs, they seem to have more authority then the president of the United States. Clearly this present debacle like most others coming out of EPA, is Junk Science. There is no such thing as man made Global Warming,”get over it”. Let’s us become energy independent, by developing all our known energy resources here at home first. While we develop other alternative resources, and prove them both technically, feasible, and ask ourselves, are the cost effective, before we jump off the cliff? Finally, for our leaders who cannot think for themselves, or refuse to listen to rational technical experts on a give subject, vote them out of office, come the November elections? I believe the mandate from the Energy Independence and Security Act of 2007 is to use 35 billion gallons of ethanol by 2022. We are using about 12 billion gallons today. We may have to distill Chevis Regal to meet the mandate. Can anyone get Congress to repeal this horrible act of 2007. The only two parts of the act I now about is the ethanol mandate and the requirement to phase our incandescant light bubls by 2015. There undoubtedly is other disaster in the bill we have not read about. The few Oil Refiners we have in this country should absolutely STOP PRODUCTION. But, how do we stop the EPA, is the bigger question.